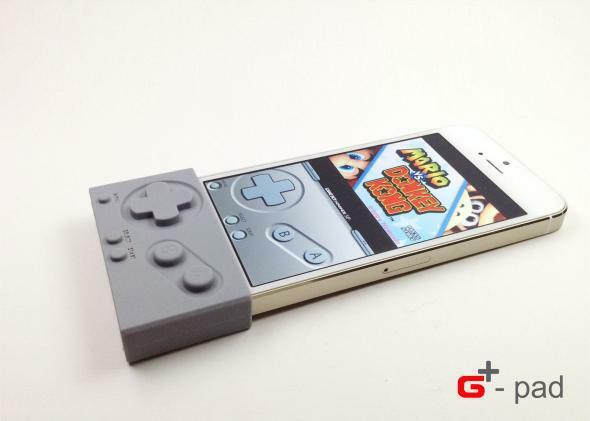 G-pad, GBA4iOS: This sleeve turns your iPhone into a GameBoy. But there's a catch. This Sleeve Turns Your iPhone Into a GameBoy. There’s Just One Problem. The great triumph of Apple’s iPhone, beyond the whole revolutionizing-mobile-devices thing, is that an effectively buttonless gadget has become today’s default gaming system. But while, say, Angry Birds works just fine with a touchscreen—and is in fact harder to play with a regular controller—nothing pushes gamers’ buttons like actual buttons. Enter the G-pad, a silicon sleeve that slips onto your smartphone to restore what it’s dearly missing. Covering roughly a third of the screen, the G-pad outfits your phone with a four-way directional pad and an A and B button, A oriented in a pleasingly familiar upper-right angle to B. If the layout reminds you of the classic Nintendo controller interface, well, that’s the whole point. Gizmodo heralds the G-pad, which designer Aws Jan is crowdfunding on Indiegogo at $13 a pop, as something that “turns your iPhone into a Game Boy.” All you have to do is download a program called GBA4iOS, slip on the G-pad, and you can play through a giant chunk of the Nintendo library—Mario, Donkey Kong, Zelda, and more, the way they were meant to be played, all for free! It’s understandable that pirates want to do what Nintendon’t. With the Wii U selling poorly, Nintendo has been urged by fans and shareholders alike to start releasing smartphone versions of its top franchises. But the Big N, perhaps heeding what happened to Sega when it started developing software for its onetime rivals, has steadfastly refused to consciously uncouple its software from its hardware. * Does this give non-Nintendo entities the right to do the uncoupling on their own, without Nintendo’s permission? No. As with this browser version of Super Mario Bros., GBA4iOS only hurts Nintendo. Believe me, there’s no one on Earth who’d rather play old Game Boy games like Advance Wars on his iPhone than me. But Advance Wars is still for sale. Nintendo brought it to the Wii U just this month. If staying the in-house course proves to be a bad strategy for the folks at Nintendo, that’s their funeral. And if you won’t take my word that piracy ain’t cool, take it from someone a lot cooler than I am. Now, there’s nothing inherently larcenous about the G-pad itself, and I’m excited for it just as an invention. Like North Face’s Etip gloves, it’s another small step in opening up the potential of a wonderfully versatile, but still fundamentally limited, platform. A platformer like Limbo, which was made for home systems and somewhat awkwardly adapted to smartphones, would really benefit from optional G-pad functionality. And hey, Nintendo, the G-pad would work really well with Advance Wars. *Correction, April 15, 2014: This post originally misstated that Sega has become a software-only company. Sega still develops arcade games.